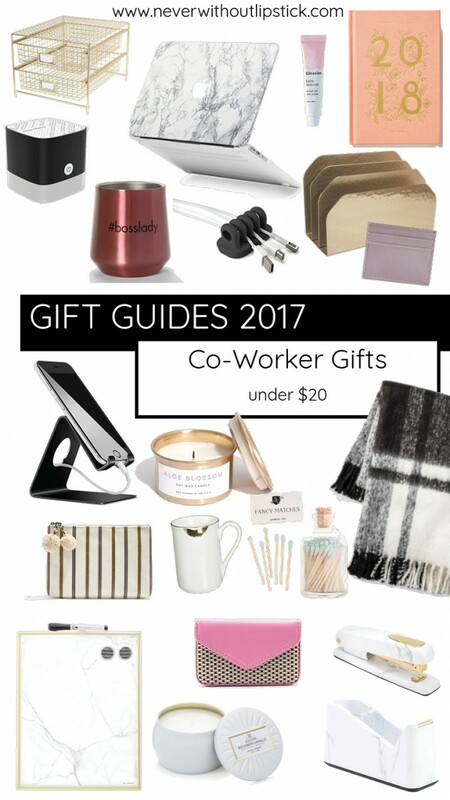 This guide to small gift ideas for co-workers was a special one for me to write! It’s my first holiday season with actual co-workers to think about, so it was fun coming up with little gifts that would bring a smile to their face. Think of how much time you spend with your team each week! You’ll want them to feel appreciated and show them a little extra love during the giving season. As I made this guide, I really tried to think of gifts that would either improve your co-worker’s time at her desk or a special treat for when she’s relaxing at home. We spend lots of time at our desks each day so why not give cute little accents to brighten up her workspace! iPhone Stand: In the age of women complaining about their “tech neck,” an iPhone stand is a necessity. 2018 Planner: Even though Google Calendars are the standard in the workplace, it’s always nice to write out your weekly commitments on paper. I haven’t been able to give up a paper planner since high school (but I’m also super Type A, as you may know, lol!) A planner this pretty would be a gorgeous accent on your co-worker’s desk and just in her life in general! Marble Laptop Case: This case can give anybody’s laptop that little makeover it needs to go to the chicest in the office. Leather Card Case: A small card case is such a lifesaver when you need your essentials with you but don’t want the full-on wallet. It’s a perfect gift for someone on the go like your co-worker! Cozy Throw Blanket: I don’t know about your office but ours can get crazy cold. We all have a cozy blankie hanging on the back of our chairs to throw on when the chill rolls through. Marble Desk Accessories: I can’t believe these are available at Target! Giving a cute stapler and tape dispenser set is a fun way for your co-worker to dress up her desk. Just think about it, her workspace is where she spends so much of her time every day so why not give her some chic accents to transform her space! Cute Toiletry Bags: Bags like these are always cute to give either as a makeup bag for someone’s purse or for travel. Your co-workers might be traveling over the holidays, so this could be a cute gift idea to fill with some travel size beauty or skincare goodies. Business Card Holder: I know that I hate that my business cards are floating around in my purse or my wallet. Give your co-worker a professional edge with this card holder to keep all her cards organized and in one place when she needs them! Loving these small gift ideas for co-workers feature? Take a look here for more of my gift guide favorites! Can you tell me where that boss lady cup is from?? I need it! Hi Christina! Thanks so much for reading! Here is the link for the cup: http://bit.ly/2AL2rRT, enjoy! !